You may have seen a lot of ads on Facebook selling you the dream of upgrading from an HDB to a condo, “Sell your HDB and buy two condos for a secure future in Singapore!”, “Upgrading from an HDB to a condo with the same salary? Easy!” and so on. Let’s not beat around the bush, this is clickbait. There is one crucial question to answer when it comes to upgrading from an HDB to a condo: can you afford to keep the HDB you own as an investment, or do you need to sell it before upgrading to a condo? Am I eligible to upgrade to a private property if I currently own an HDB? What are the financial implications if I sell my HDB and upgrade to a condo? Can I afford to sell my HDB and upgrade to a condo? What are the financial implications if I keep my HDB as an investment and upgrade to a condo? Can I afford to keep my HDB and upgrade to a condo? When upgrading, should I buy a new launch or a resale condo? What are the steps to upgrade from an HDB to a condo? 1. Am I eligible to upgrade to a private property if I currently own an HDB? Before you can find out if you can afford to upgrade to a private property, you need to check if you’re even eligible to do so. There are two criteria to check for this: the MOP of your HDB flat and your citizenship. To be able to upgrade to a condo or landed property from your HDB flat, you need to have completed the Minimum Occupation Period (MOP) for your HDB flat. Typically, you need to have been living in your HDB flat for a minimum period of 5 years before you can upgrade to private property. The MOP is the minimum number of years you need to have physically occupied your HDB flat before you can buy a private property or sell the HDB. In the case of upgrading from an HDB flat to a condo, the MOP is calculated from the date you collected the keys to your HDB flat to the date of signing the Sale and Purchase Agreement of your new property, regardless of whether it is still under construction or ready for possession, and excludes any period where you did not occupy it. To find out if you’ve completed your MOP, you can visit HDB’s site or contact us so we can help you through the process of checking this. If at least one of the owners of your HDB is a Singapore citizen, then you can keep the HDB and also the condominium that you intend to buy next. However, if all of your HDB flat’s owners are Singapore Permanent Residents (SPRs), then you cannot keep the HDB after buying a private property. You must sell it within 6 months of buying the condominium in Singapore. Provided that your eligibility is not a concern, your ability to keep the HDB flat or the need to sell it before upgrading will depend on your finances. Hence, we will share everything you need to know in terms of affordability to determine which one makes sense for you. 2. What are the financial implications if I sell my HDB and upgrade to a condo? There are several financial implications to take into account when upgrading from your HDB to a condo. Depending on whether you buy a condo first or sell your HDB first, the CPF amount you can use for buying is impacted. If you buy a condo before selling your HDB, it will be considered your “second property”. Due to this, some restrictions apply on the amount of CPF you can withdraw for the purchase. You can withdraw up to a maximum of 100% of the condo’s Valuation Limit (VL) from your CPF Ordinary Account (Valuation Limit = The lower of the market value or the purchase price of the property). Example: let’s say the condo you want to purchase has a market value of $1,005,000 and the price you purchased it for is $1,000,000. In this case, the VL = $1,000,000 (lower of the two). So you can withdraw upto $1,000,000 from your CPF Ordinary Account. You need to set aside a Basic Retirement Sum (BRS) in your CPF, before being allowed to withdraw any money for the condo purchase. What this means is that you need to keep a certain amount of money in your combined CPF accounts, and can only withdraw the amount in excess of that. This minimum amount to be set aside is stated on CPF’s site, and varies based on your age. Example: let’s say you turn 55 years old in 2019, your BRS is $88,000 as per CPF’s site. So if you have a total of $100,000 in your CPF (from your Ordinary Account + Special Account + Retirement Account) then you can withdraw $100,000 – $88,000 = $12,000 from your CPF OA account for buying the second property. The CPF withdrawal limit might be lower based on the remaining lease of the condo you are buying. If the condo has a remaining lease of ≥ 60 years, then you can withdraw up to 100% of the property Valuation Limit from your CPF Ordinary Account (OA), i.e. Withdrawal Limit = Valuation Limit. If the condo has a remaining lease of < 30 years, then you cannot use your CPF money to purchase the property. 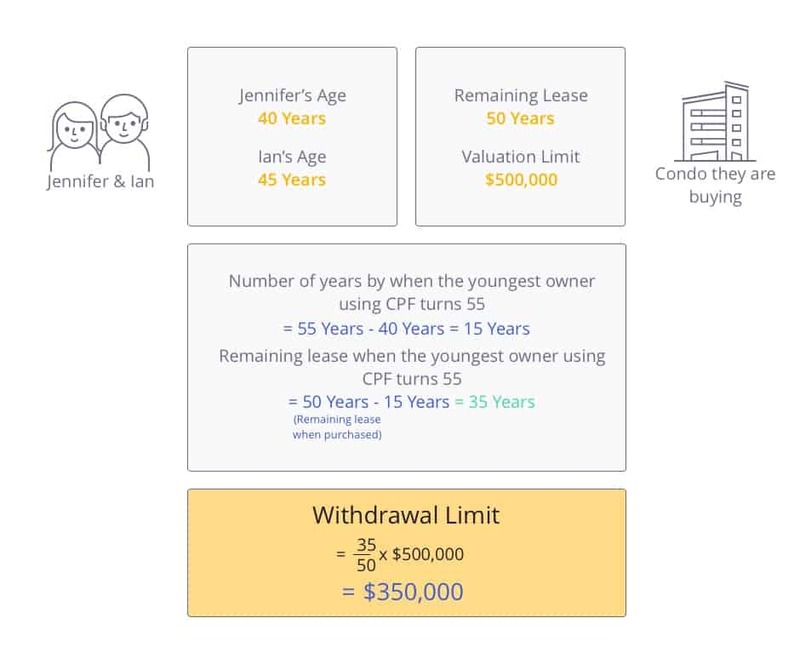 Image 1: Calculation for how much Jennifer and Ian can withdraw from their CPF accounts for buying a condo with a remaining lease of at least 30 years but less than 60 years. If you’re selling your HDB before buying a condo, the entire process is more straightforward for you. After the sale, you have to return the amount of money borrowed for your HDB purchase and the interest it may have accrued over the years back to your CPF Ordinary Account (OA). You have to do this even if you buy a condo first, it is simply a matter of when you do it. Furthermore, when buying your condo, you will be allowed to withdraw upto 120% of the Valuation Limit of the condo (Valuation Limit is the lower of your condo’s market value and purchase price) instead of 100%. However, note that the limitations stated above on the withdrawal amount based on the condo’s remaining lease still applies. When you sell your HDB before upgrading to a condo, the proceeds from the sale of the flat will be used to pay off the outstanding HDB loan amount. In the case where the sale price of the HDB flat does not cover the full outstanding loan amount, you need to pay the balance in cash. Make sure you give your HDB branch a written notice of at least one month in advance to make the repayment. If you’ve already paid off the loan on your HDB flat, it doesn’t matter whether you sell the HDB first or buy a condo first. You would get the rate for “First Housing Loan” for the condo purchase in either case. Assuming your HDB flat’s loan is not yet paid off, it matters whether you buy your condo first or sell your HDB first. Buying first means you would already have a housing loan at the time of applying for one for the condo, so you would get the Loan-to-Value (LTV) for “Second Housing Loan” from the table below. If you sell first, then the proceeds from your sale will be used to pay off your existing housing loan. Hence, when buying the condo afterwards, it would be your “First Housing Loan”. How does my age impact the loan amount? People can sometimes forget that their age matters a lot for their next loan! The monthly mortgage and loan tenure for the property they want to buy next will be calculated based on it, and given that they have fewer years to pay off the loan, they will have to either borrow less or pay more per month based on their age. If your age + the loan tenure is ≤ 65 years, the LTV is higher than when it is > 65 years. If the “borrower” is actually a couple, for example, you and your spouse, your combined age is taken based on your income. It is called your Income Weighted Average Age (IWAA). 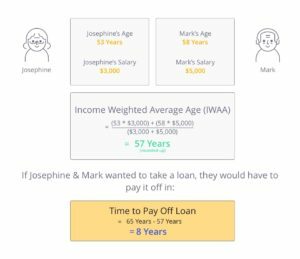 Image 2: Calculation for Josephine and Mark’s Income Weighted Average Age (IWAA) and the time available to pay off their loan. Hence, even if the loan amount they are eligible for is higher, their time to pay it off is much shorter, thus increasing the amount they need to pay per month. The Total Debt Servicing Ratio states that you cannot use more than 60% of your monthly income to service your debts. This includes your home loan, car loan, student loan, credit cards, etc. So how does this impact you? If you were to take a loan for buying a condominium in Singapore, the maximum loan amount you can take is subject to TDSR restrictions, meaning that even if the LTV for your bank loan is high, the amount of money you can get as a loan depends on your income. Mark and Josephine have a combined salary of $8,000. They have sold their HDB and want to purchase a condominium. They currently service two debts – their car loan and their credit cards. The values below are based on monthly income and expenses. 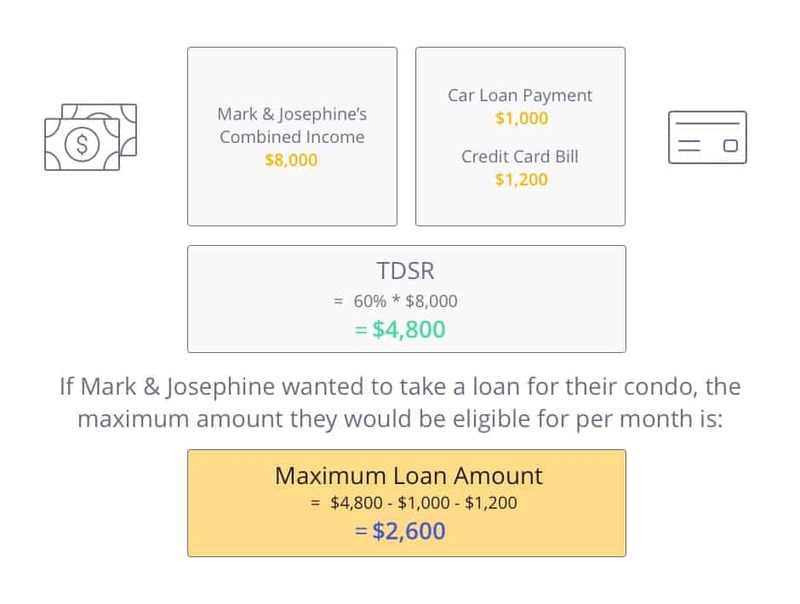 Image 3: Calculation of the maximum amount that Josephine and Mark can borrow per month for their second home loan, with their current debts, after TDSR restrictions. This means, assuming they are young enough to get a 25 year loan tenure, the amount they can borrow from the bank including interest is $780,000. The “principal loan amount” i.e. the value that the bank will lend them for buying a condo is ~$519,392. Assuming they only have enough money to make the downpayment, the maximum value of the condo they can buy is ~$692,469. If they are older and only qualify for an 8 year loan tenure based on their IWAA calculated above, they can get a maximum principal loan amount of ~$217,426, meaning the maximum value of the condo will be ~$289,902. Since this is too low for a condo, they would need to use other cash savings and the proceeds from their HDB sale. The definition of “Upgrading” here is different from that in the rest of the article. Here it refers to the Upgrading Programme by HDB, whereas in the rest of the article it refers to buying a more expensive property. HDB undertakes Upgrading Programmes such as adding lifts in old HDB blocks that don’t have them or implementing maintenance works for old HDBs with issues, to minimise the inconvenience caused to its residents. When such an Upgrading Programme is undertaken in a block, the residents have to pay the Upgrading Programme’s Costs. If a particular Upgrading Programme’s bill was issued while you were the owner of the flat, you still have to pay for the Upgrading Programme’s Costs before selling the HDB. Following the previous point, if you live in an HDB unit that went through an Upgrading Programme, you would have to pay an Upgrading Levy upon selling the flat. This is different from Upgrading Programme Costs. Basically, the Upgrading Programme Costs is to pay for the Upgrading work itself, whereas the Upgrading Levy is a kind of “fee” to pay when you sell an HDB flat that previously participated in the Upgrading Programme. If your unit was Upgraded, you will have to pay an Upgrading Levy of 10% of the selling price or 10% of 90% of the market value of your flat, whichever is higher. You can read more about who needs to pay an Upgrading Levy and examples of how to calculate it here. A resale levy only applies when you’re selling a subsidised HDB flat to buy another subsidised HDB flat. Since you are buying a private property next, it will not apply to you even if you sell your new/resale HDB. Barring exceptional cases, you need to have completed your MOP before you can buy a condo or sell your HDB. This MOP is typically 5 years. Since your property “Holding Period” is at least 5 years, you do not have to pay any Seller’s Stamp Duty (SSD) (which is only applicable when selling properties with holding periods of 4 years or less). Irrespective of whether you keep your HDB flat or sell it, you need to pay a Buyer’s Stamp Duty (BSD) when you buy a condo. The rates above were set on February 20, 2018. Image 4: Calculation for how much BSD Josephine and Mark would have to pay if they buy a condo worth $1,000,000. If you sell your HDB flat first, you do not have to pay any ABSD. But, if you buy a condo first, it would be your “additional” or “2nd” property (assuming you don’t have any others), so you will be liable to pay an ABSD. However, if you sell your HDB flat within 6 months of buying the condo, you are eligible to apply for a remission (provided either you or your spouse is a Singapore Citizen). Considering that you are an HDB owner, you already know how Property Tax works. It is charged based on the “Annual Value” (AV) of the property you are living in. The AV is based on the estimated gross annual rent of the property if it were to be rented out, excluding furnishings and maintenance fees. Example, if your unit had an estimated market rental value of $2,000 per month, your AV is $2,000 * 12 = $24,000. You will need to pay property tax on the condo you purchase in a similar way. If you’re not sure what the AV of the condo you intend to buy is, you can find it on IRAS’ site. Below, you can find the property tax rate for a property that you own and occupy i.e. you live in it. So for an AV of $24,000, you would pay nothing on the first $8,000 and pay 4% on the remaining ($24,000 – $8,000 = ) $16,000 which would come up to $640. This is a non-refundable administrative fee for the submission of the HDB resale application. It is $40 for 1 and 2-Room flats and $80 for 3-Room and bigger flats. If you are using HDB lawyers for your sale, you can estimate the legal fee using the Legal Fee Enquiry service on HDB’s website, which estimates your legal fees based on the type of your HDB (i.e. 2-Room, 5-Room, etc.) and the selling price. This would typically cost you a few hundred dollars. If you decide to engage your own lawyers, they will advise you on the legal fees applicable. You would need to hire private lawyers for your condo purchase which would typically cost you a few thousand dollars depending on the law firm you’re hiring. Service and Conservancy Charges are charges for the maintenance of the common facilities in your HDB block. You must pay the service and conservancy charges for your HDB flat up to the HDB sale completion appointment date. You can find the details of your service and conservancy charges through your Town Council. Similarly, when you upgrade to a condo, you will need to pay monthly maintenance fees for the upkeep of the common facilities in your condo. It can be as little as $200 or as much as $1,200, depending on the condo. For selling your HDB, an agent will typically charge you 2% of the HDB’s selling price (this is the standard market practice). However, at Propseller you can find top agents who charge a commission of 1%. For buying a condo, you do not have to pay any property agent fee i.e. it is a free service. When selling, it is important to hire an experienced HDB property agent. A bad agent can cost you more than they can save you, and considering that this is one of the largest financial transactions of your life, look out for a good and experienced one. If you don’t already have such an agent, you can find one on Propseller. 3. Can I afford to sell my HDB and upgrade to a condo? You have to calculate two things here: the proceeds from your HDB sale and your affordability. It’s important to calculate your sale proceeds so that you can determine the cash proceeds and your affordability for a condo. Mark and Josephine own a 5-Room HDB flat and want to upgrade to a condo. They bought their flat 10 years ago, and want to estimate their potential sale proceeds. 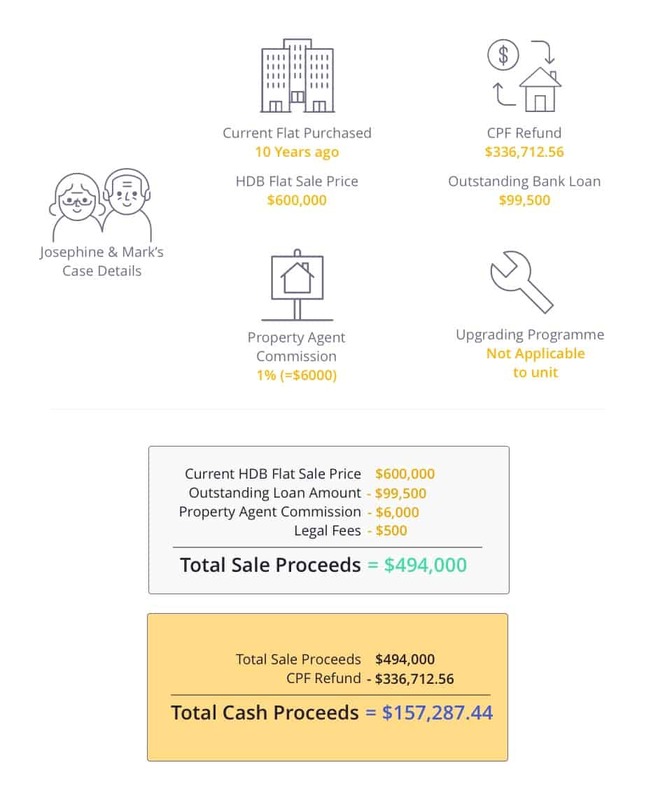 Image 5: Calculation for how much the sale proceeds and cash proceeds will be from selling Josephine and Mark’s 5-Room HDB flat. If Josephine and Mark manage to sell their HDB at $600,000, they make almost $500,000 in sale proceeds. They next have to see if this is enough for them to afford a condominium. Another way to calculate if you can afford it is by seeing the upfront cash+CPF outlay needed, and determining whether you can afford it. 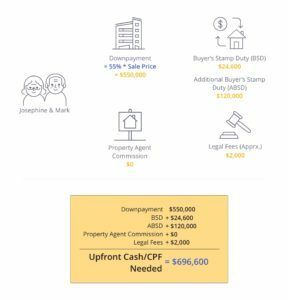 Since Mark and Josephine want to buy a condo, they want to determine the upfront cash/CPF needed for buying a condo worth $1,000,000. 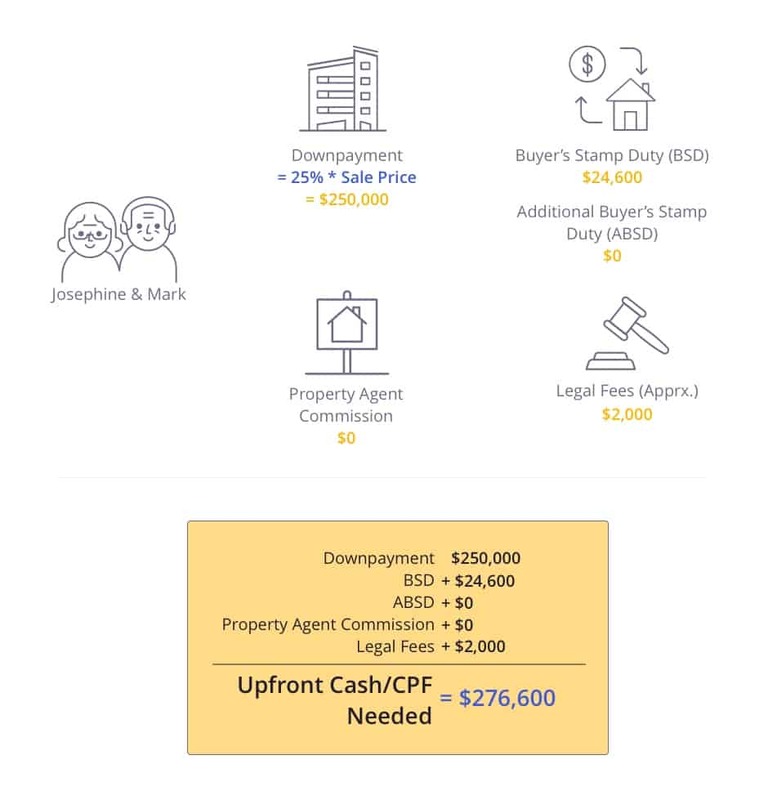 Image 6: Calculation of the upfront cash/CPF that Mark and Josephine need to afford a condo worth $1,000,000 after selling their HDB. You can see from here that their sale and cash proceeds from the HDB sale more than cover this amount, hence it should be entirely feasible for them to purchase such a condo without dipping into additional savings, if they take a loan for 75% of the condo’s value. 4. What are the financial implications if I keep my HDB as an investment and upgrade to a condo? Keeping the HDB you own as an investment property and upgrading to a condo definitely sounds tempting to many Singaporeans, especially if the rental income is close to or more than the mortgage payable every month. There are however some other financial considerations to think about to see if you can afford it. Below, we list all the implications of keeping your HDB and buying a private property in Singapore. Note that by right, you need to be occupying your HDB after you buy private property, but you can ask permission from HDB to be allowed to rent out your HDB flat. Since you are keeping your HDB, the condo you are buying will be your second property (assuming you don’t own any other properties). Thus, you will be subject to the same rules as “buying a condo first” stated above, i.e. You can withdraw up to a maximum of 100% of the condo’s Valuation Limit from your CPF Ordinary Account (Valuation Limit = The lower of the market value or the purchase price of the property). You need to set aside a Basic Retirement Sum (BRS) in your CPF, before being allowed to withdraw any money for the condo purchase. What this means is that you need to keep a certain amount of money in your combined CPF accounts, and can only withdraw the amount in excess of that. This amount is stated on CPF’s site, and varies based on your age. The CPF withdrawal limit might be lower based on the remaining lease of the condo you are buying. If the remaining lease is at least 60 years, your withdrawal amount will not be affected. 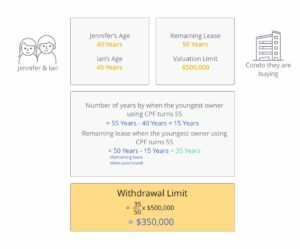 If it is at least 30 years but less than 60 years, it will be a percentage of the withdrawal amount, based on your age and the remaining lease. Finally, if it is less than 30 years, then you cannot use your CPF to pay for the property. To see some real-life examples and understand these rules better, you can visit this previous section of the article where we elaborate more on it. It is okay for you to have an outstanding HDB loan on your current HDB flat when you buy a condo and want to keep both of them. Thus, buying a condo does not affect your HDB loan in any way. Assuming you don’t have any property other than the HDB flat you own, the new condo will be your second property. If your HDB’s loan is not yet paid off, the Loan-to-Value (LTV) that you can get for your “second housing loan” is much lesser than that of your first. However, if the housing loan for your HDB is already paid off, then the condo loan counts as your “first housing loan” and not the second. The rates are based on how many housing loans you have at the time of applying for the condo loan. You can see the rates for the first housing loan vs the second in this previous section of the article. You can see from that table that if the loan for the new condo you are purchasing is considered a second home loan, then you will be allowed to borrow only 45% of the value of the condominium, meaning that you need to pay the remaining 55% using cash or CPF. This could be a huge undertaking for a lot of people, but if you have the necessary savings, you are good to proceed. As stated before, the Total Debt Servicing Ratio states that you cannot use more than 60% of your monthly income to service your debts, including your existing home loan, car loan, student loan, credit cards, etc. Since this is your second property and assuming it is also your second loan, this could have a huge impact on how much you can borrow per month and consequently, overall for your condo. Let’s assume the same costs stated before for Mark and Josephine, in addition to a monthly mortgage payment of $1,000 for their existing HDB. The values below are based on monthly income and expenses. 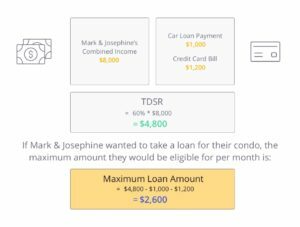 Image 7: Calculation of the maximum amount that Josephine and Mark can borrow per month for their second home loan, with their current mortgage and other debts, after TDSR restrictions. If Mark and Josephine had sold their HDB, their Max Loan amount per month would’ve been $2,600 as shown in the previous section. But since they are keeping it and have an outstanding loan which requires a payment of $1,000 per month, their maximum loan amount to buy a condo is $1,600. This means, for a 25 year loan tenure, they can borrow a maximum of $480,000 in total (including interest), where the principal loan amount, i.e. the amount they can borrow from the bank at the time of purchasing is $319,601. Assuming they only have enough money to make the downpayment, the maximum property value will be $426,135. You can see that there is a difference of almost $266,000 between the maximum property values when you sell the HDB vs when you keep it. As mentioned before, the definition of “Upgrading” here is different from that in the rest of the article. Here it refers to the Upgrading Programme by HDB, whereas in the rest of the article it refers to buying a more expensive property. The Upgrading Programme is conducted by HDB to improve the facilities in certain older HDBs, such as adding lifts or implementing maintenance work. Since you are keeping your HDB, if the block it is in becomes a part of an Upgrading Programme, you have to pay for it. Following the previous point, if you live in an HDB unit that went through an Upgrading Programme and sell it, you have to pay an Upgrading Levy or fee for selling it. Since you are keeping your HDB, you do not have to worry about this. A resale levy only applies when you’re selling a subsidised HDB flat to buy another subsidised HDB flat. Since that is not the case for you, you do not have to worry about it. Buyer’s Stamp Duty (BSD) applies to all property purchases in Singapore. Thus, you will be liable to pay it for the condominium you are purchasing. To see the rates and an example of how BSD is calculated based on the property price, you can see this earlier section in the article. Ah, the thorn on every 2nd home buyer’s side – Additional Buyer’s Stamp Duty (ABSD). Since the condo you purchase will be at least your second property, you will have to pay an ABSD. The rates are as shown below for a second property purchase. The rates above were set on July 6, 2018. If this is your 3rd property or higher, check the ABSD rates on IRAS. 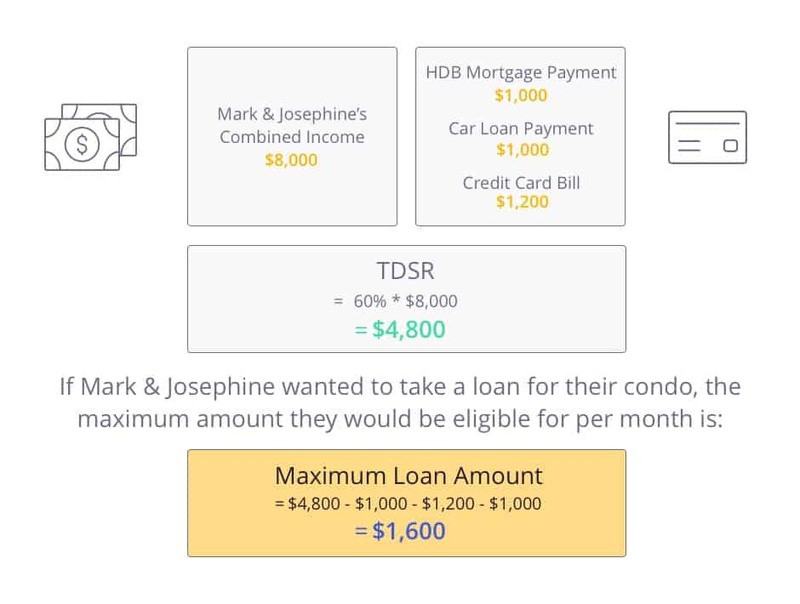 Image 8: Calculation for how much ABSD Josephine and Mark would have to pay if they buy a condo worth $1,000,000 without selling their HDB flat. As you can see, the minimum payment for Owner-Occupied property is 0-4% whereas for Non-Owner-Occupied properties it jumps to 10%, which could be a significant chunk of the rental income. So for an AV of $24,000 for a non-owner-occupied property, the property tax would be $2,400 (when it is owner-occupied, it is $640). Some other costs such as the ones stated below can apply. It will cost you ~$2,000 or more (based on the law firm you hire) to hire lawyers for a private property purchase. You would have to pay a property agent for renting out your HDB. The fee is usually ½ month’s rental for a 1-year lease and 1 month’s rental for a 2-year lease. Example, if your HDB’s monthly rental is $2,000, you have to pay the agent $1,000 if they find you a tenant who signs a 1-year lease and $2,000 if they sign a 2-year lease. However, you do not have to pay anything to use a property agent’s services for buying a condominium in Singapore. It is important to get an agent experienced with renting out HDBs in your area to ensure you get the highest possible rental amount and in the shortest amount of time, so that you do not have many weeks of vacancy, which could impact your overall income from the unit. If you don’t already know of such an agent, you can find one on Propseller. 5. Can I afford to keep my HDB and upgrade to a condo? Mark and Josephine want to buy that $1,000,000 condominium without selling their HDB, and want to determine the upfront cash/CPF needed to be able to do so. Image 9: Calculation of the upfront cash/CPF that Mark and Josephine need to afford a condo worth $1,000,000 if they keep their HDB as an investment. 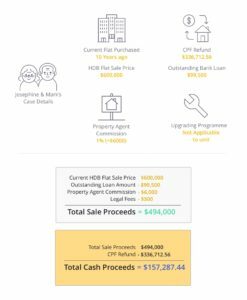 You can see here that instead of $276,600 which is how much they needed in cash or CPF when they sold their HDB, they now need $696,600 to buy a condo if they keep their HDB. Below, we summarise the main differences between selling and keeping the HDB before upgrading to a condominium (or any private property in Singapore for that matter). For the table below, we are assuming that in the case of “sell the HDB”, the sale of the HDB is made before the purchase of the condominium for simplicity sake and that the condominium being purchased has at least 60 years of lease remaining. 7. When upgrading, should I buy a new launch or resale condo? There are two important differences when buying a new launch vs a resale condo. Before we go into the specific differences for you between buying a new launch or a resale condo, one very important thing to note is this – property agents make tremendously different amounts of money when they bring a buyer for the sale of a new launch condo vs a resale condo. For a new launch, they could make anywhere between 3-6% of the property value, whereas for a resale, they make between 0.5-1%. To put these numbers into perspective, for a $1M condo, getting you to buy a new launch could potentially make them $60,000 whereas if you buy a resale condo, it could only (in relative terms) get them up to $10,000. That’s not to say that buying a new launch is a bad deal, it means that developers are simply able to pay more than individual sellers are to property agents. Because of this huge gap in commission, it leads to a bias in what (some) property agents would recommend to you and shift your interests towards. Therefore, just make sure that if you buy a new launch, it is because you like it and it fits your requirements, and not because it is being hard sold to you. Now, let’s list the differences between a new launch and a resale condo below. Keeping these in mind, resale condos may be a safer bet for several buyers due to the certainty and knowledge of knowing what you’re getting. In any case, whether you choose a resale or new launch condominium, make sure that it is what fits your requirements and that you are not being convinced into making a less favourable purchase. 8. What are the steps to upgrade from an HDB to a condo? The upgrading process can vary based on whether you’re selling at all, selling first or buying first. Below, we’ll show you the steps to sell as well as buy. Generally, it would take around 8 weeks from submitting the sale documents to getting an appointment with HDB. If you’re renting the HDB instead of selling, the process is a lot more straightforward. And voila! You’re done. The main thing that takes time with rentals is the time to find a tenant. This could take anywhere from 2 weeks to 10 weeks, depending on the unit, the price, the demand and so on. Buying takes a lot less time than selling. You would follow the steps shown below with your property agent (condo buyers don’t have to pay their property agents, so you can use this service for free). You can find the timeline of events for upgrading from an HDB flat to a private property such as a condo as shown in the infographic below. Note that the timeline to rent out your HDB is not covered below. Image 10: Timeline of events for upgrading from an HDB flat to a condo. In conclusion, there are a few main things to remember when upgrading from an HDB flat to private property such as a condominium or landed property. First, check if you are eligible to buy a condominium. Second, check the financial implications of selling vs keeping your HDB. Third, calculate your affordability for buying a condo based on whether you want to keep or sell your HDB. Fourth, based on your affordability and loan eligibility, find the budget for your unit. Fifth, decide if you would like to proceed with a resale condo or a new launch, with clear reasons in your mind. And finally, start with the action steps for selling/renting and buying. Have any questions about upgrading from an HDB to a condo? Ask us in the comments below or on the chat icon on the bottom right of your screen! Don’t have an agent yet? Find agents experienced in downgrading HDB flats on Propseller, to start your journey.